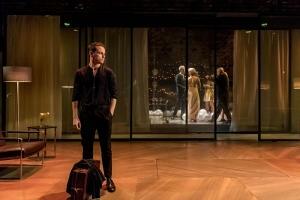 Review: I used to feel like I'd seen a lot of Shakespeare, and then I realised I was seeing a lot of the same things, and namely Hamlet ( I must have seen at least three version over the last few years) and whilst Hamlet has some of my favourite moments in it, I've almost become a bit desensitised to it, so I set the standard high. Anyone who may have met me, may not that at times I have a short attention span at times so when I saw this production was going on three and a half hours I shivered inside. I always forget how long Hamlet can be, so it needed to be good. We all know the story of Hamlet, tragic hero, who is charged by the ghost of his dead father to avenge his death. His plight slowly descends him into suspected madness and the affects are felt by those around him. There is a greater tendency to have Shakespeare in modern, convoluted settings, to add a dynamic, especially as verbatim, Shakespeare can be times hard to understand if you're not au fait with it. Here we have a modern Hamlet, set in a castle with CCTV allowing us to explore the plot, but whilst this was a modern take, it wasn't over the top or in your face, it worked, it felt natural. Andrew Scott made a great Hamlet. We all know the famous Hamlet speeches, and we all know how to overact them. TO BE OR NOT TO BE that I will shout out at you. But Scott did it differently. His whole vibe, wasn't sad and broody, it was this subtle anger and angst, and it was like he was talking to you, venting his troubles, the way we all want to talk about our problems. It had a whit and he played off the characters well, allowing the reality of the situations stand out in their awkwardness, because the play if full of them. The play for me focuses around the five strong characters, Hamlet, Gertrude, Polonius, Claudius and Ophelia. Hamlet stood above them, and does within the play, so their characterisations needs to be just as strong. I liked Juliet Stevenson's Gertrude performance, she had a strength and authority, that allowed a vulnerability. Counter balanced to both their performances was Claudius. He is not meant to be a loud character, and I never liked him ( nor do I think you're meant to) but Angus Wright (to his detriment) played him so dull, flat and monotone. He was an is a drip. Polonius was always a bit of the comic in this for me and his is played up here, and Peter Wright does the job well. I think one of the main problems for me was Ophelia. I really like Ophelia as a character, I just didn't like the way of her decent into madness from Jessica Brown Findlay. There was something about it a bit off kilter so she wasn't what I wanted her to be. But that's theatre for you. The ending was also a little modern for me, and with perspective it makes sense for the style of the play, I liked the visual imagery of it, but at the time it felt weird. 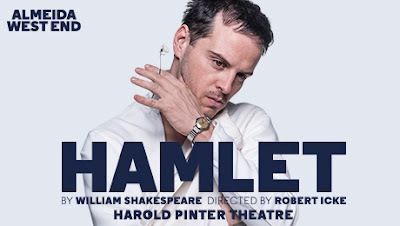 I mention it only because it sticks with me, but it should not detract from what was a great production and will stand up there with the great Hamlets I've seen.